Board index ‹ Family & Community ‹ GetUp! In the last 48 hours, David Hicks has given his first television interviews. As the nation focuses on his story, let’s ensure Australia is never again complicit in torture. 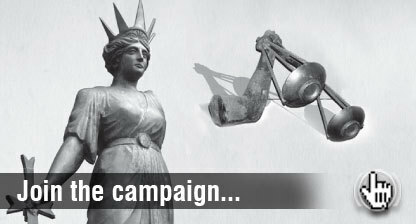 Click here to email your MP to ask the Government to launch an inquiry into the torture and mistreatment of Australians in Guantanamo Bay. Australians are owed an explanation. Recently David Hicks revealed that he was tortured while he was held prisoner at Guantanamo Bay over a period of five years – claims that are supported not only by his military lawyer Major Mori, but also by Brandon Neely, a former guard at Guantanamo Bay. How did our government allow this to happen? 1) Torture is wrong and claims an Australian citizen has been tortured must be investigated. 2) If Australian officials are complicit in torture they must be held to account. 3) This must never happen again. Five years ago, GetUp members fought to bring David Hicks home – not because we believed in his guilt or innocence, but because we believed in the standards of a free and fair society: including the right to a fair trial, freedom from torture and the principle of innocence until proven guilty. Five years later, we are still owed an explanation. Can you email your MP and ask the Government to find out what really happened, so we can ensure this never happens again? An Australian was imprisoned for five years – without a fair trial, and allegedly tortured. This is not just about what happened in Afghanistan or Guantanamo, but what happened inside Canberra to allow this. Let’s demand the whole truth, finally. Allegations in the David Hicks interviews raise a number of questions: were Australian officials aware that an Australian citizen was allegedly being tortured? If so, when did they find out, and what did they do about it? Is it true that the United States would have released David Hicks earlier, but the Howard Government required a conviction for political reasons? Why didn’t the Australian Government secure David Hicks’ transfer from Guantanamo Bay much sooner, as other countries did for their citizens? As GetUp members said five years ago, no Australian should have to bargain with their liberty because their basic human rights have been abandoned. David Hicks’ story will once again fade from the headlines, but as citizens, it’s our right to find out the whole truth, and ensure this never happens again.